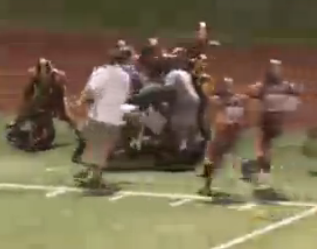 SOMERVILLE (CBS) - Police had to intervene in a bench-clearing brawl at a women's professional football playoff game in Somerville, Mass. on Saturday between Boston Militia and the D.C. Divas, reports CBS Boston. The teams have been rivals for many years, and during Saturday's game emotions reached a boiling point. Throughout the game, players and coaches say the teams were talking trash towards each other, and after an interception at the end of the game, things turned physical. "It was festering but you never thought it would've got to that point," said Boston's quarterback Allison Cahill. Boston Militia defensive back Jennifer Powell says all she can remember is having her helmet ripped off her head and then getting attacked by D.C. Diva players. Even after the melee, the Militia still came out on top after a 55-34 win. The team went 10-0 this season, and with Saturday's win, they qualified for the National Conference Championship on July 21 against the Chicago Force.